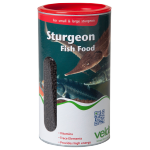 A sturgeon needs special sturgeon feed, because its mouth is at the underside. Sinking feed is concerned here, which has a very strong odour, to the effect that it resembles its natural feed. 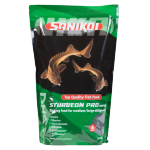 There is special sinking feed for all kinds of sturgeons, with a high energetic value geared to the metabolism of a pond sturgeon.